Nord Star is a name of boat Hanse 415 ,which has been manufactured in 2015. You can rent this yacht from port Sant Antoni de Portmany in surrounding area of Ibiza. Nord Star is furnished with 8 beds. Berths on the boat are arranged in 8 layout. 3 bedrooms are situated inside the boat Nord Star. Browse for other vessels here: Yacht charter Ibiza. Crew members can feel comfortable on this vessel , because there are 2 WCs for their disposal. With 160.00 l l. in fuel tank you can sail really far and still be independent because of 320.00 l l. in water tank. Nord Star is supplied with motor 38 hp. Sailboat's dimensions are: lenght - 12.40 m , beam - 4.17 m and 2.10 m of draft. On the yacht is placed following equipment: Autopilot, Gps plotter, Bimini top, Anchor electric windlass, Bow thruster, Mainsail with lazy jack, Inverter 12v-220v, Radio / cd player, TV. . Nonrefundable caution is at the level of 2500.00 EUR. 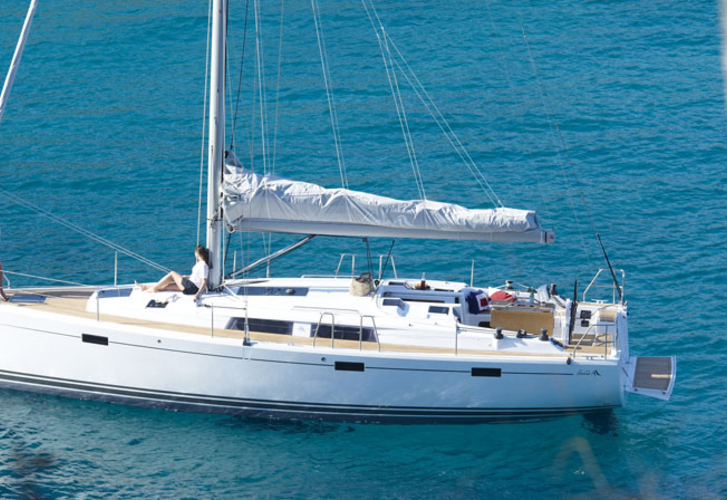 In our search machine you can quickly check avalailability of sailboat Nord Star from Sant Antoni de Portmany under the link: Yacht charter Balearics.